Guided Mark-Up: AP Spine Measurements - Website of metron-md! Max Cobb Angle: This is the largest angular difference between any two vertebrae. Max Angular Deviation: This is the largest angular value (away from vertical) of any vertebra. 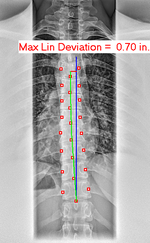 Max Linear Deviation: A vertical blue line is drawn on the image starting at the center of the lowest vertebra picked. This is the largest distance horizontally away from this central line of the center of any vertebra.